Friends, strangers, and family members will pat their chest and encourage jumping up. So if you don't want your dog to jump up, don't let people reward her for it. But patting our chests, petting, and paying attention aren't the only ways that dogs get rewarded for jumping up. Dogs love attention. If the only way they can get attention from us is in the form of negative attention, then they will take that over no attention at all. 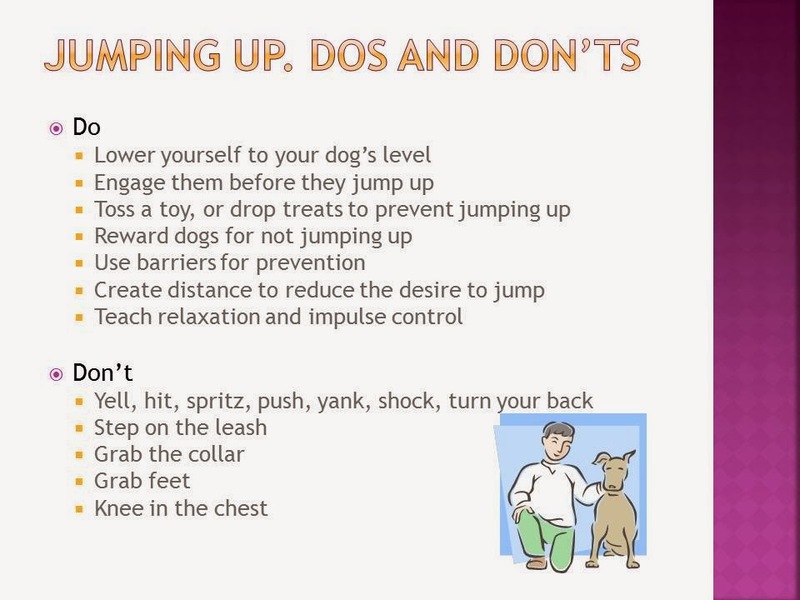 So yelling at our dogs or pushing our dogs when they jump up usually won't stop a dog from jumping. It might even encourage more jumping. Preferably we want to redirect jumping before it happens. But if we are too late and our dogs jumps on us - do nothing. No talking, no pushing, no looking. No turning around. Pet parents might need to wear thick clothing or figure out how to brace themselves if the dog might injure. - Drop treats on the floor before your dog starts jumping. We'll talk about this in part IV. - We can also experiment with how we enter a room or enter the residence. The more calmly we enter, the more calm our dogs will be. If it's safe to do so and if physically possible, we might try crawling into entrances so our dog will have no reason to jump up. - Kneeing a dog in the chest. It might cause injury. It might increase arousal and increase jumping up. - Leash yanking. Don't yank the dog by the leash. It can cause injury and it can cause negative associations and once again will do nothing to decrease arousal and might increase it.